After Exhibit - Newest Arrival! This bicycle arrived in our mail yesterday! I was surprised to see it. 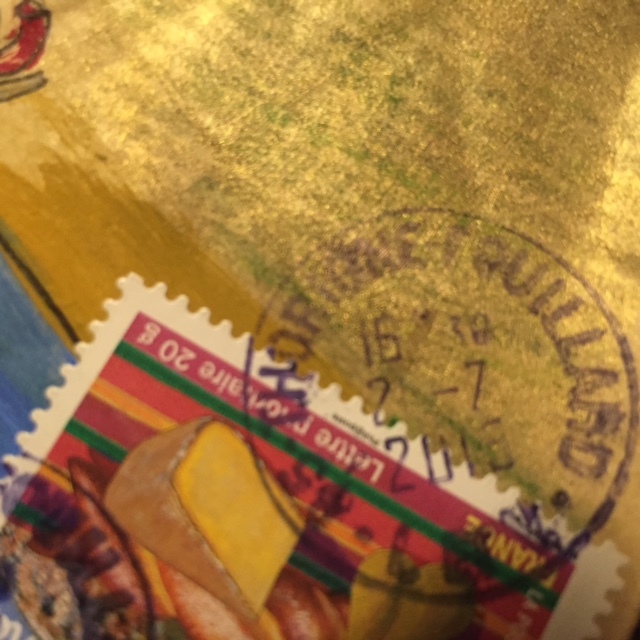 I'm not sure when it was sent because the postage stamp cancellation isn't clear, but I think it was recent. The cards from the exhibit were dispersed. I'll keep this one in my archives. It's from Bruna Berger in Brasil. Thanks Bruna, for sending a bicycle. Last night, we went to our local for a late dinner, after the server took our order, another server, whom we've known for years, came over to me and said - "you left some of your mail here." I was puzzled by this, which she noticed on my face. 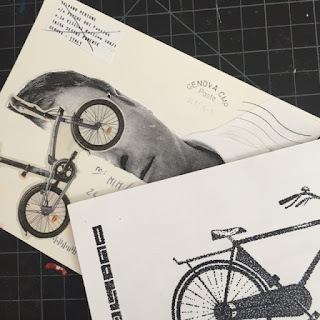 "The bicycle mail." That was even more puzzling. "Last week, when cleaning up, we found mail with your address on it." She went and got it from the bar, where they'd stashed it. This is what she handed me. 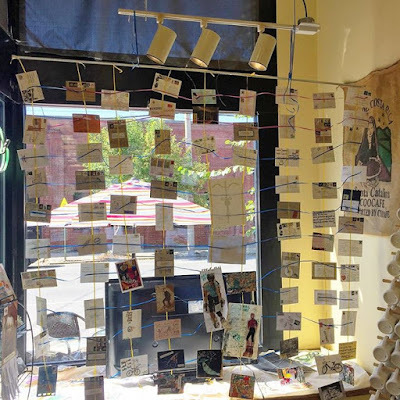 What happened is this, or so I surmise - Someone chose a couple of the entries from the Mail Art exhibit that were in a box at the Coffee shop being offered to the public for free, to take home and display. They could donate to an animal rescue organization or not as they chose. AND that person, had dinner at Joe's Inn (our local) and left their choices behind. Boo Hoo, they are probably really sad about this. I have no idea who they could be, but I'll keep these safe and if anyone ever mentions to me that they lost their lovely choices, I can give them back. What a successful exhibit! My most successful, and made so by ALL of the participants. Oh happy heart! 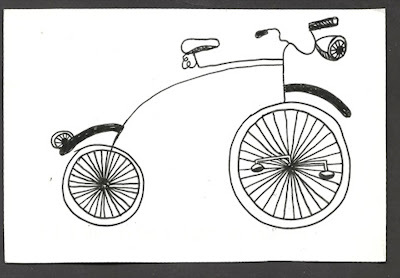 Another amazing entry for the Bicycle themed Mail Art exhibit arrived here in Richmond, VA on Friday, 16 October. Size: 23 cm x 32 cm / 9" x 12.75"
The narrative is delightful! I can't believe it missed being in the exhibit, but I'm going to take it round to the coffee shop so they can see it. Doesn't it look like this was mailed on 2 July at 4pm? Help me out here, if I'm reading this incorrectly. If this is true, then this has been on it's way for a long time. I hope that people have enjoyed it along the way. Thank you so much, merci beaucoup, Christine. This is such fun and so beautifully done. Brava! How long has it been on it's journey? And why did the USPS think it needed to be in a protective envelope? 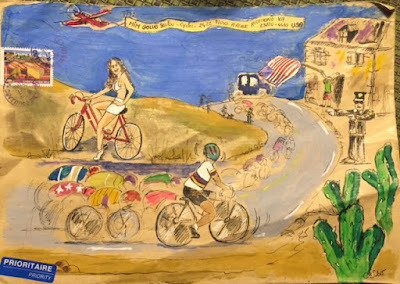 I really like the mixed media collage that was sent to me for the Bicycle exhibit. I'm sorry it missed the deadline for the installation, however, I will bring it by for the folks at the shop to see it. Who sent it? I can't read that information clearly, nor can I read the cancellation date on the stamp. If anyone can help me decipher this, I'd appreciate that. 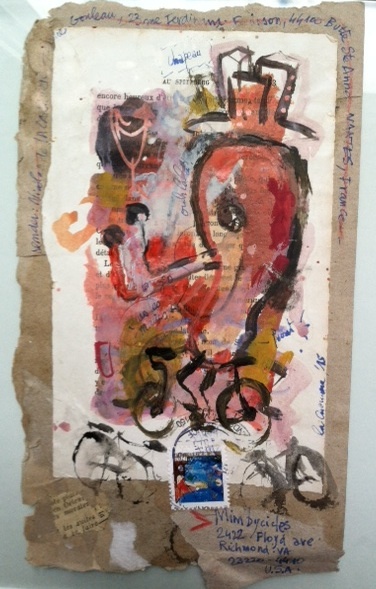 Thank you, Uli Grohmann, from Münster, Germany, for giving me the correct name and address for this submission. Very exciting to open the Richmond2015 app and see that OUR Mail Art exhibit had top billing! Yay, us. I went to the venue today to see, in person, what an imaginative way that the work was installed. It was better than I'd hoped. The work is in the front window and in a prominent display inside the shop. 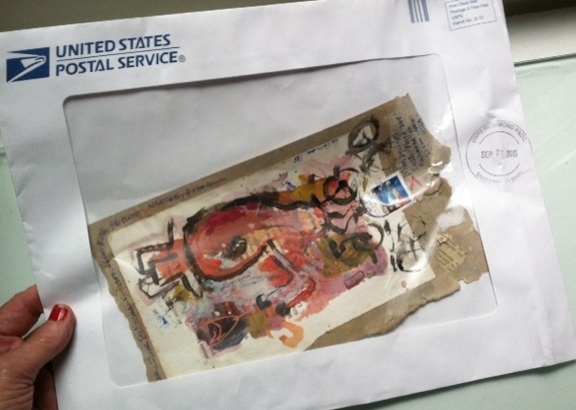 Well done, thanks to all who sent in Mail Art, and the installation team. Excellent show, which will get lots of viewers. It's so exciting to know that the exhibit has such good publicity. Information sheet - all the names! 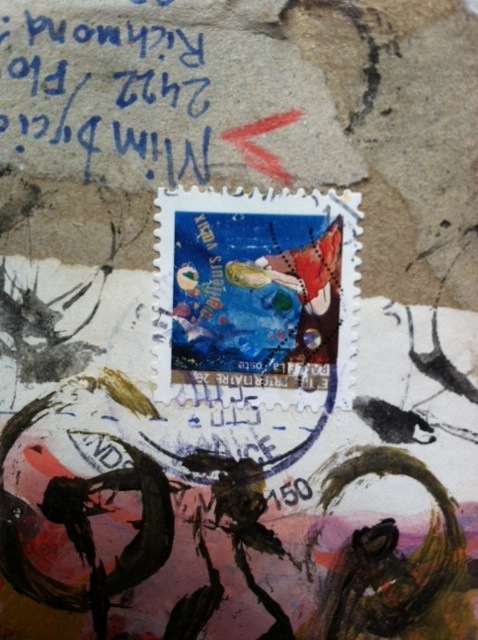 Magda's photo has been on it's way to us for awhile. Happily, it finally arrived. The photo was taken in front of the railway station in Groningen, the Netherlands. 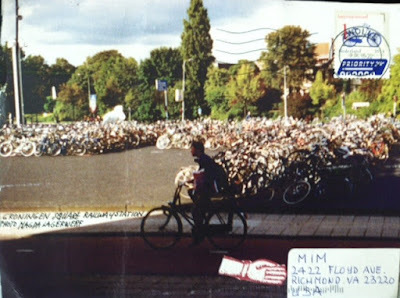 It reminds me of the first time I arrived in Amsterdam and was stunned by the number of bicycles parked in front of Centraal Station. Wow! was all I could say, and here I see it again in this photo. Thanks for the memories, Magda. This is the first photo of the installation. These are in the window, the rest are in the shop. The folks at the venue did a wonderful job. I can't wait to go over there and get more photos to post. Thanks to Tammy and Lauren for helping make an idea a reality.